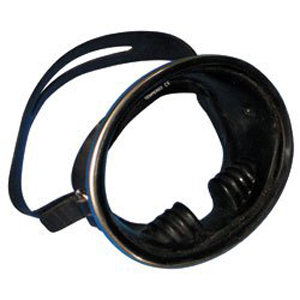 The Sonar Bali Rubber Mask is a traditional style oval mask made from black rubber with a stainless steel rim. This type of classic, single lens oval style mask was launched in 1958 and made famous by early James Bond films and the Sea Hunt TV series. Fits medium to large adult faces. Great for a Vintage look for Scuba Diving and Snorkelling. The design of this single frame mask has a timeless look. It's changed little, with its rubber skirt, internal finger wells for equalisation, traditional buckles and metal rim. The skirt is mounted to the rubber to help the mask form to the face for a better seal. Despite the age of this mask design, it still affords a good fitting seal and extended field of vision both vertically and horizontally, albeit with a large volume.